PowerBook G4 Display Manufacturing Defect Cover-up? "Whenever someone considers purchasing something new one of the initial reactions is to determine if the current model(s) will be updated in the near future. This true for automobiles, gadgets, electronics and of course computers. This post will provide insight into how Apple updates and refreshes their line of Macintosh computers with particular emphasis on the MacBook and MacBook Pro lines." Editor's note: The article includes some excellent timeline charts of MacBook and MacBook Pro product introduction/revision history and observes that Apple's current Back-To-School promotion ends on Monday September 15, 2008, and while Apple has never released MacBook or MacBook Pro updates in the midst of a Back-To-School promotion, that doesn't mean that they won't. Best guesses: September 9, 2008 or the week of September 15, 2008 (Tuesday September 16, 2008 highly likely). "Apple appears to be censoring discussion of a display manufacturing defect in the PowerBook G4 17-inch and have not acknowledging that the defect even exists. Notebook computers, especially 17s, are an expensive investment to have just go belly-up shortly after they come out of warranty. 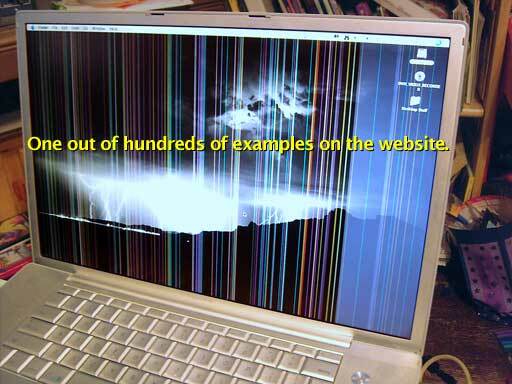 Some people have had their machines die right after the one-year warranty expires...."
Link: PowerBook G4 Display Manufacturing Defect Coverup? "This site has been made available to the owners of 17" PowerBooks that are suffering from the one pixel wide, vertical lines problem. The majority of the PowerBooks that were posted on Apple's site before being deleted, were manufactured in the W8 factory based in Shanghai around April of 2005, model: M9689 PowerBook G4 1.67 GHz. "I encourage you to post your information and photographs here as Apple constantly close down, lock or delete any threads containing manufactoring information, photographs or links to external sites discussing this problem on their forums! "This kind of action by Apple suggests to me that they are aware of a known defect, do not want to address it and are scared of the bad publicity that would result from a recall or repair extension program. Let's not forget the recent battery recall! "If, like me, you find Apple's blatant censorship and refusal to address this problem unpalatable (bear in mind that when launched this machine was the top of the line PowerBook and cost around $3000 US), then post your PowerBook's information here and together we will hopefully get Apple to face up to the fact that they sold 17" PowerBooks that have a serious manufactoring defect and should be repaired or replaced at once with no cost to the owners." "We all know that installing 4 GB of RAM will speed up a MacBook and make the whole experience that little bit more smoother and quicker - but what can you do NOW for FREE that will help speed your bundle of joy along and keep it's user happier? I will tell you 6 things that will help...."
"When you're looking for the leaders and front runners in technology, you can be assured to find Apple's name there. They certainly have amazing products and lots of innovative machines and it has totally expanded into the arena of computer manufacturing. refurbished Apple laptops have been a major player in computer technology since years back. "All of their computers are great, but their latest laptops are highly advanced and efficient. These computers give you better performance and their efficiency is excellent...."
"Apple's laptops have had some interesting encounters at airport security checkpoints. The wafer-thin design of the MacBook Air befuddled one security officer earlier this year in the US, who asked to give some 'special attention' to the 'fine piece of machinery,' according to Bob, who blogs for the US Transportation Security Administration (TSA). After inspection, the laptop was returned to the owner. "Users don't have to remove their MacBooks from their bags anymore, thanks to new 'checkpoint-friendly' laptop bags. It's a hassle to remove laptops and place them in bins, so these bags allow X-ray machines to screen laptops from inside bags. The bags are designed using guidelines provided by the TSA, which wants a clear view of the laptop through the bag...."
"Solid-state drives are fast becoming popular replacements for hard drives, especially in laptops, but experts caution that SSDs aren't as secure as commonly thought. "Overall, it's easier to delete data from SSDs than from hard drives, which can be a good or bad. Data is stored on electrons in SSDs, and getting rid of electrons flushes out the data . . . In hard drives, the data has to be overwritten or physically damaged to prevent it from being read." "Although declining a separate announcement, Intel at its Developer Forum has formally introduced the Core 2 Duo 'S', its first factory-stock processor based on the same small package technology that was rushed into use for the MacBook Air and similar systems. The chipmaker confirms numerous leaks and reveals that the switch to a 45 nanometer process lets it improve performance while reducing the size and power use. "Although running on the same 1,066 MHz system bus and with the same 6 MB of Level 2 cache as newer Core 2 Duos, the 'S' and its accompanying chipset are 60 percent smaller overall while the processor itself uses 17 watts at its thermal design peak versus 20 watts for its Apple-focused ancestor. Both also keep the same hardware virtualization and trusted execution as for their larger counterparts." "Slipping underneath the radar amidst talk of Nehalem and other next-generation technology, Intel at the San Francisco edition of its Developer Forum this week announced its first regularly available processor based on the same, very small chip packaging that made the MacBook Air possible. "Nicknamed the Core 2 Duo S, the 1.6 GHz and 1.86 GHz parts share the same basic architecture as chips released in July but consume about 60 percent less surface area through both a smaller main processor and smaller bridge chips used to interface with memory and peripherals." "The Core 2 Duo S, which first appeared in Apple's MacBook Air, trims both size and power consumption by a significant degree. "The shrunken Core 2 Duo processor that Apple dropped into its iconic Air is now available for public consumption. Intel finally slipped out specs on the "Core 2 Duo S" at developer conference in San Francisco this week...."
"For some users, the new generation of ultraportable notebooks comes close to embodying the Holy Grail for road warriors. Their laptop-like keyboards make them more usable for typing tasks than smart phones, but they are lighter and cheaper than traditional laptops. The original Asus Eee PC, for instance, cost about $400 and weighed about two pounds when it was introduced last October. "However, while pundits and technology journalists have lavished attention on these products, skeptics have raised questions. For instance, is there anything really special about these devices, or do they just represent old technology in new packaging? Are users as enthusiastic about these tiny laptops as the pundits are? Will they fade away like so many other 'next big things'? 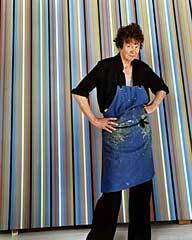 And perhaps the oddest question: What do we call these things, anyway?" "With the MacBook Pro, Apple discarded the old PC Card slot in favor of ExpressCard/34, a more compact expansion slot that offers greater transfer speeds and an increasing array of uses. The ExpressCard format has a couple of advantages over the old PC Card format. "First, it's narrower: ExpressCard/34 cards are 34mm wide, compared with the 54mm PC Cards. (ExpressCard/54 cards do exist, but they don't fit in the MacBook Pro.) ExpressCards also require less power - 1.5 volts, compared with 3.3 volts for the PC Card. But their biggest advantage is speed. 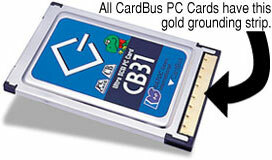 An ExpressCard passes data to the system at up to 2.5 Gbps; PC Cards supported speeds of only 1.06 Gbps. "Here is just a sampling of the ExpressCards available. It's by no means encyclopedic, but it should give you an idea of how you can expand your laptop's powers...."
Late on Friday, Apple released a small firmware update for the MacBook Air notebook. It's just a 368 KB download, so should only take seconds even over dialup. PR: The LapStrap makes carrying your laptop easier than ever before. Simply place the LapStrap over your laptop, close the lid and you instantly have a shoulder strap. By attaching LapStrap to your laptop you can continue the use of your existing travel bag and navigate the security checkpoint with ease. The Transportation Safety Agency has implemented a new rule allowing Checkpoint Friendly laptop bags to be utilized in security scanners. TSA stated that it will not endorse or approve any one bag design or manufacturer. This requires TSA Officers to individually identify checkpoint friendly criteria for every laptop bag. Two results: upset travelers who are asked to remove their laptop from what was thought to be a checkpoint friendly bag, or decreased security as bags and laptops are not required to be exposed. As many manufacturers are getting in line to produce the next Checkpoint Friendly laptop bag, there is one product that has taken a different route. As most of these "checkpoint friendly" bags are $100 or more, issues may arise with travelers who are being asked to remove their laptops from their new bag which was purchased to resolve such situations. For $24.95, the new LapStrap not only allows continued use of your existing laptop bag, but through company testing has not resulted in a single request by TSA Officers to be removed from the laptop. The innovative LapStrap is a simple accessory that creates a shoulder strap for your laptop computer. The LapStrap makes carrying your laptop easier than ever before. 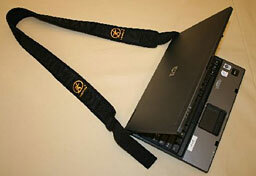 Simply place the LapStrap over your laptop, close the lid and you instantly have a shoulder strap. By attaching LapStrap to your laptop you can continue the use of your existing travel bag and navigate the security checkpoint with ease. LapStrap allows the computer to be secured over your shoulder which frees both hands to gather additional items such as keys, cell phone, and boarding pass. Even with the disclosed "Checkpoint Friendly" criteria, the Transportation Security Administration states that Officers reserve the right to have any laptop removed from its bag, even if the bag is considered "checkpoint friendly" by the manufacturer. Another issue arises with laptop travelers if requested to check bags planeside. Many have faced this scenario and find themselves scrambling to remove their laptop as they board the plane. 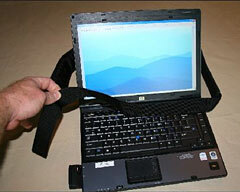 By having LapStrap attached to the laptop, the laptop now becomes easily secured for transporting. LapStrap is available in both adult and youth sizes. Constructed with durable nylon, LapStrap also includes a neoprene shoulder pad for comfort. Heavy-duty buckles allow LapStrap to be adjusted to secure all laptop sizes. LapStrap can be custom colored and branded for your company, school, or organization. LapStrap is a great promotional item as your logo can be "front and forward" on the shoulder of everyone who carries a LapStrap. Whether faced with a security line, a coffee shop, a quick meeting, or a class LapStrap offers the flexibility to decide to carry your full bag or simply your laptop. LapStrap can be purchased online for $24.95. PR: Listen to more music, watch more videos, and get more work done with more run time between recharges! The NewerTech NuPower 74 watt-hour replacement battery delivers up to 56% greater capacity than the stock Apple® iBook® G3 'Clamshell' battery. Upgrade or replace your battery with a high capacity NuPower battery today . . . it's better than the your other battery when it was new. Up to 56% Higher Capacity vs. Original! More capacity = more running time! NuPower Li-Ion batteries are top tier and are designed, engineered, and manufactured in the USA! The actual Li-Ion cells used in ALL NuPower batteries for PowerBooks and iBooks are of the best quality and made either in Japan or Canada. This is in stark contrast to the arguably inferior battery products produced overseas with cheaper battery cells. Not only do NewerTech batteries provide more run time vs. stock Apple and other brands, NewerTech batteries are also built to last longer - providing more use cycles before a replacement is needed. Each new battery also includes a free label to return your old battery for proper recycling or disposal. more info. As the premier provider of high capacity replacement batteries for PowerBooks, iBooks, and iPods, NewerTech is committed to helping your older batteries find their way to recycling stations instead of into waste dumps where the heavy metals leach out to contaminate the environment. When you purchase a NewerTech battery, we will cover the cost for you to ship your old battery from the same system the new NewerTech NuPower battery was purchased for. We will then ensure the battery is properly recycled/disposed of. PR: ExpressAdapt represents the second generation of CardBus to ExpressCard adapters, combining benefits of previous generation 16-bit and 32-bit adapters. Integrating the latest NEC ECOUSB controller with Synchrotech's advanced voltage regulating circuitry gives ExpressAdapt major advantages over competing devices. Utilizing ECOUSB provides ExpressAdapt with significant compatibility and performance features. First ExpressAdapt needs no drivers on contemporary mainstream operating systems, it is recognized and supported automatically. Second, it harnesses the fastest USB 2.0 throughput to complement the latest HSDPA and EVDO Rev. A ExpressCards. Lastly, ExpressAdapt's integrated controller allows for low power consumption and price. Almost no changes from last week except the 2.6 GHz 15" MacBook Pro for $1,849 is sold out. Each model comes with an Apple one-year warranty, and ground shipping is free. For more deals on current or discontinued models, see our MacBook deals, MacBook Air deals, 15" MacBook Pro deals, 17" MacBook Pro deals, 12" PowerBook G4 deals, 15" PowerBook G4 deals, 17" PowerBook G4 deals, titanium PowerBook G4 deals, iBook G4 deals, PowerBook G3 deals, and iBook G3 deals.